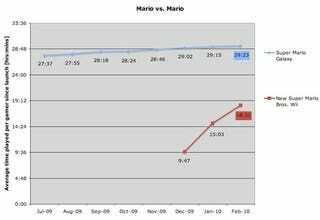 The average amount of time a person plays New Super Mario Bros. is climbing quickly and could catch Super Mario Galaxy. Call of Duty is surging. But Wii Sports Resort is flattening. Here are three key Wii comparisons of satisfaction. Each month Kotaku tracks the average playing time of games on the Wii. This is what I call the "measure of pleasure," the amount of hours people play these games. The numbers are cumulative since the game launched. Today I've pulled some older data to look at how some of these games and their sequels compare over time. Up top is a comparison of the two biggest Mario games on the Wii. We've got 2007's Super Mario Galaxy vs. 2009's New Super Mario Bros. Wii. Galaxy's been out longer, and its climb from launch isn't included in the chart. Instead, what we can see is that it's average playing time has been growing slowly since last summer. That;s a sign that most people seem to be playing it a bit more each month and that new sales aren't dragging down playing times. Below it, we see the post-launch surge of New Super Mario Bros. Wii. The climb is impressive, but it's hard to say whether NSMB Wii can catch Galaxy or it will flatten. Remember, this isn't a comparison of sales. New Super Mario Bros. Wii may outsell Galaxy without ever attaining a higher per-player average. A better comparison would be one that compares two games for their entire history. I've got the data to do that for 2008's Call of Duty World at War and 2009's Call of Duty Modern Warfare Reflex Edition. In this case, we can see that Reflex's first three months show a sharper ascent than the early months of World at War. Are World at War players going to abandon that game, which has online play, for Reflex, which also does? World at War's playing time did drop in the past month but one month is not a trend. If that continues to drop as the other game rises, we could see a sign of a player base shifting from one to the other. And here's 2006's Wii Sports vs. 2009's Wii Sports Resort. The older game has been around a lot longer and has a huge average playing time despite the fact that every Wii owner has the game — and therefore has a chance to pop the game in just once and pull down those average playing times. Wii Sports Resort has healthy numbers, but appears to be flattening already, making it hard to imagine it's going to gain the heavy-rotation playing numbers of Wii Sports. What other comparisons would you like to see? All data for these charts was pulled by Kotaku from Nintendo's Wii Channel. For more on the methodology, check out this post.